It’s finally that time of year when spring produce is popping up at the market. Thank God! Chicago was handed a pretty rough winter and everyone is aching for some warmer weather and pretty much the sight of anything but snow. Fiddlehead ferns, ramps, rhubarb and English garden peas are all such a sight for sore eyes right now. Lately I have the fridge stocked with ramps to use them for anything from salad dressing to a quinoa sauté to throwing them on the grill. Though, one of my favorite go-to’s (especially if I have too many ramps and not enough time to cook them all!) is to make a pesto with their greens. Just like you would make a traditional pesto with just basil, add some of the ramp greens and you will be amazed at how delicious and light they taste in the delicious medley of olive oil, toasted nuts and herbs. 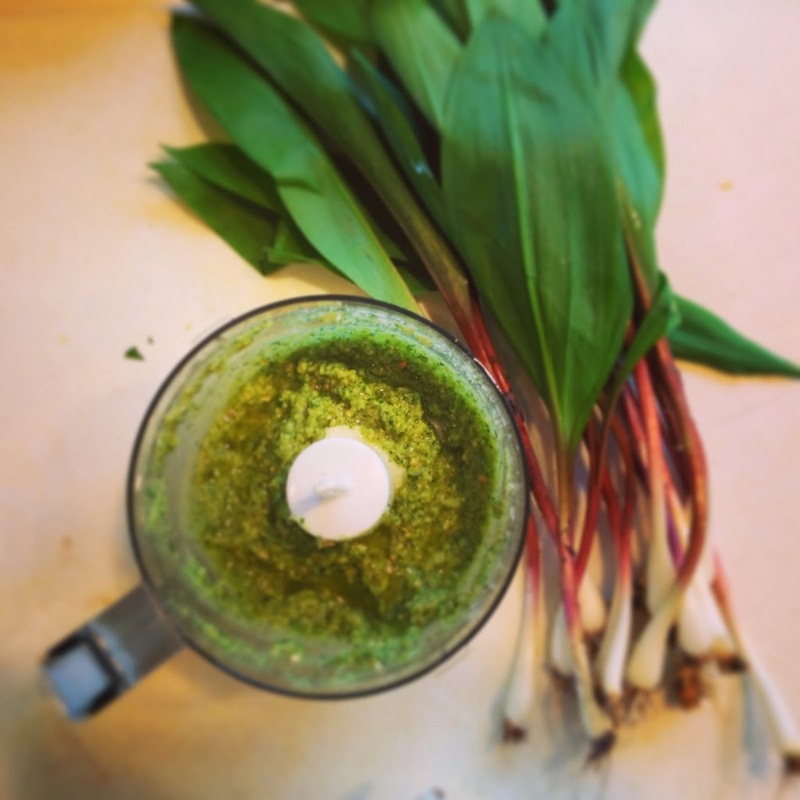 Made into a sauce and kept in the fridge, the ramp pesto will keep for weeks in a glass jar so it’s a wonderful way to always have a flavor boost at hand and not waste any of those little gems that might otherwise go to waste. And on those busy days when you don’t think you have enough time to make dinner from scratch? All you need is a nice piece of fish, some chopped vegetables and a bit of this pesto…voilà! Delicious pesto flecked fish and roasted veggies at hand, and it couldn’t have been better than a day of sunshine in Chicago. Mangia! 1. Separate the white from the green leaves of the ramps. Roughly slice the leaves and two of the white bulbs and place in the base of a small food processor. Save the other whites for another time. 2. Roughly slice through the basil leaves and add to the bowl. 3. Add all remaining ingredients to the food processor bowl and blend until you have a lovely green sauce, not pureed, but pretty smooth. 4. Taste for seasoning and add more salt, more sugar or more oil as needed. *to make this dairy free and vegan, add nutritional yeast in lieu of the parmigiano cheese.